* Oversize regal 3pc bedspread set big enough to cover your pillow top mattress. * Full/Queen: 102x110"(WxL), two pillow sham: 20x26"+2". one square pillow: 16x16". 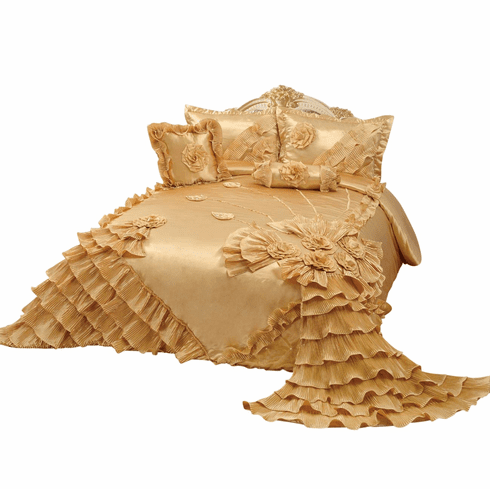 one neck roll: 6x16" * King/CalKing: 120x110"(WxL), two pillow sham: 20x26"+2". one square pillow: 16x16". one neck roll: 6x16" * spots Clean or dry clean. No Bleach. * Guaranteed to make any couple feel like royalty.This Bedspread is Unbelievably Soft and Warm, Resilient Material withstands Pilling even after washing. Impress your Guests,Family and Friends with this Regal Comforter Set. * 100% polyester satin facing, 100% polyester fill in, 100% polyester backing.